SEOUL, South Korea, June 29, 2018 /PRNewswire/ — Eone-Diagnomics Genome Center (EDGC; Co-CEO, Minseob Lee, Shangcheol Shin), the global leading company in genomic analysis, has successfully completed the ceremony celebrating its listing on the Korea Securities Dealer Automated Quotation (KOSDAQ) at the Korea Exchange on June 26. 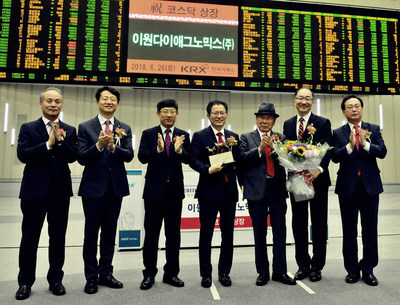 EDGC has successfully completed the ceremony celebrating its listing on KOSDAQ at the Korea Exchange on June 26. EDGC is the international joint venture between Eone Life Science Institute in South Korea and Diagnomics in the Unites States of America. EDGC was established in 2013. It analyzes personal genes based on big-data technology, predicts genetic diseases and suggests personalized lifestyles to prevent diseases. EDGC mainly provides clinical and consumer genetic services based on Next Generation Sequencing (NGS) technology: the first integrated genotype and phenotype test ‘MYGENPLAN™’, personalized medical check-up ‘gene2me®Plus’, inherited ophthalmologic genetic screening test ‘MyEyeGene®‘, non-invasive prenatal test ‘NICE®‘, newborn genetic screening test ‘bebegene®‘ and so on. In addition, it has focused to enhance its competitiveness through the business expansion into the area of liquid biopsy, transplant rejection. EDGC is striving to develop and dominate overseas markets including the Chinese market. It plans to accelerate and make headway in the market by providing genomic analysis services and transferring technologies to overseas companies. Current services available in Southeast Asia and Middle East have provided excellent business results. To target overseas markets, it has acquired domestic and international certifications including, College of American Pathologists (CAP), Clinical Laboratory Improvement Amendments (CLIA), CommunauteEuropeen (CE), International Organization for Standardization (ISO) 13485. The business value of EDGC is estimated at KRW 400 billion. The largest shareholders of EDGC are Cheol Ok Lee, Chairman of Eone Life Science Institute, largest commercial laboratory in South Korea; Kolmar Korea Holdings which is the global No. 1 in cosmetics Original Design Manufacturing (ODM); and Jun Il Kim, Founder of Lock & Lock. EDGC has attracted attention from the public prior to its listing due to the strong business results. Shang Cheol Shin, co-CEO of EDGC, said listing on the KOSDAQ is the result of efforts by numerous people, and he added EDGC will help all the people improve their health and welfare and finally become the company which proposes the change of paradigm.